The suggestion is that the physical closeness of the massage (which is reinforced for the viewer by the visual elements joining the men) triggers some anxiety in the client over the relationship, distresses him about possible homosexual content in the situation, and leads to muscular tension that the masseur can feel in his hands. Meanwhile, both men are hunky high-masculinity types (with muscular hairy forearms and short haircuts). All in all, the cartoon gives off a gay sensibility without being actually sexual. The recent move by the Associated Press [see below] to ban the use of the word “homophobia” by its reporters is smart, long overdue, and indicative of media and cultural trends. The term “homophobia,” introduced by psychologist George Weinberg in 1972, is an unfortunate euphemism. People with strong reservations about homosexuality don’t fear gays (a phobia is an irrational fear); rather, they often have an aversion to them. And that’s a euphemism too. Many people actually hate gays and even the very idea of homosexuality. … In an article I published in 2003 in Psychology Today magazine when I was editor-in-chief there, I suggested that the Greek root misos, which means hatred or aversion, was the way to go. That gives us homomisia for the noun and homomisic for the adjective. Together these sources depend on evergreen ideas that have come to be known under the heading of the etymological fallacy. In one relatively benign (earnestly Romantic, antiquity-worshiping) variant, the EF merely says that the “true meaning” of a word or other expression is to be found in its etymology, its historical source. In principle, that would be compatible with the fact that the uses of so many expressions — tens, or even hundreds, of thousands — no longer directly reflect such “true meanings”. In principle, we could recognize that the Latin pat-/pass– root meaning ‘suffer’ lies behind modern English passion in all of its uses (including ‘something arousing enthusiasm’), patient in all of its uses (including a doctor’s patient), and passive in all of its uses (including the passive voice in morphosyntax and a passive partner in a business deal) — while conceding that actual suffering is no longer any part of the semantic package for most of these uses. I hope to do a riff on etymological absolutism in another posting, but here I’ll stick to homophobia. The case is complex: early creations have the formative –phobia, borrowed from Greek in technical (mostly medical) contexts to refer to various species of extreme or irrational fear (I myself suffer from acrophobia, one of the most common of these afflictions), but in the late 18th century the element was pulled out to become a noun on its own. Epstein above (considered as one exemplar of many trumpeting etymological absolutism in this semantic domain) is looking at the compound homophobia, while the AP advice is looking at the compound in the light of the word phobia. Fact 1: homophobia is widely used now, and has been for decades, for a range of negative attitudes towards homosexuality or homosexuals or both: not just fear, but also hatred, horror, aversion, dislike, distaste, disapproval, and opposition. OED2 has 1969 as its first cite, with other cites through 1988, and it doesn’t attempt to disentangle ‘fear’ and ‘hatred’, nor is it easy to discern exactly which negative emotion or emotions the authors of the examples had in mind. We don’t have alternative formatives to express these shades of meaning, so of course what people did (very quickly, it seems) was extend the sense of homophobia to cover these other negative attitudes. There is (now) absolutely nothing wrong with talking about a 21-day quarantine, and if anyone tells you otherwise, you’re entitled to laugh at them. Fact 2. The noun phobia‘s principal use continues to be for an extreme or irrational fear. (1) Homophobia is not a phobia. If you’re an etymological absolutist, (1) is a straightforward contradiction. But a moment’s reflection should convince a sane person that the contradiction is only apparent. All (1) says is that homophobia is non-subsective. No big deal. Vocabulary of hate. Looking for a word to cover hatred and a variety of other emotions or attitudes not necessarily driven by fear (though some or all of fear, hatred, horror, and aversion often occur together in an emotional package), people have seized on an available fear word and extended it metonymically to cover a larger emotional package. It’s truly annoying that the AP Stylesheet just tells you not to use homophobia (or Islamophobia or, presumably, xenophobia), without suggesting what you should write and say instead. But suppose you propose to follow their advice, or maybe just want a word that covers your psychological state vis-a-vis homosexuals or homosexuality precisely, and suppose that this state is less in the fear zone and more in the hate zone (note that NOAD2’s main definitions for the verb hate have it expressing ‘intense or passionate dislike for’ and ‘strong aversion to’; the hate zone is the hate / dislike / aversion zone). For the moment, suppose further that you want to preserve the explicit reference to the Greek-derived terms homosexual(s) and homosexuality (rather than shifting to something involving gay or queer). What to do? (with parallel choices to replace homophobe and homophobic). In the last couple of years, I’ve grown fond of homo-hatred (as an alternative to homophobia), homo-hater (for homophobe), and homo-hating (for homophobic). I like their meatiness. Second possibility: borrow morphological resources from another language. 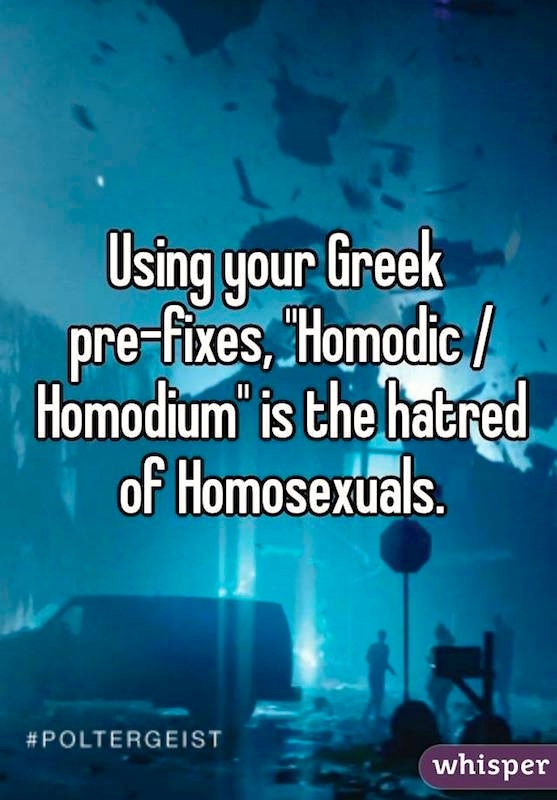 Given that homosexual is itself a “hybrid word” (like television, automobile, monolingual, and sociology), half Greek, half Latin (such words are often derided by pedantic peevers as barbarisms), those two Classical languages are the obvious places to look. Note that the meanings have been dialed back from from hate to mere dislike or contempt. If you’re an etymological absolutist, of course, you’ll insist that it has to denote hatred. Now the trick is to combine a ‘hate, dislike, aversion’ element with a ‘gay’ element. The clipped homo– (as in homophobia) will serve for the ‘gay’ element if it’s initial in the word; otherwise the full homosexual. That gives us two real easy coinages, both of which have been suggested, the first many times: homodium and misohomosexual. I’m really fond of the brief and punchy homodium (and homodist and homodic / homodistic). It does unfortunately remind me of the name of the diarrhea medicine Imodium; but nobody’s perfect. There is a genus Homodium (syn. Leptogium) of lichens, but I don’t see any chance for confusion there. As for misohomosexual, I’m irresistibly drawn to picturing a soup-drinking queer — which I was, just a few paragraphs ago in the writing of this posting. Or it could be a fancy variant of sushi queen ‘gay man who fancies Japanese men’. Which brings us back to Robert Epstein and his 2003 proposal of homomisia, the all-Greek counterpart to the Greek-Latin hybrid homodium. All this learnèd word-coining is fun, but it’s not likely to go anywhere. Fancy new words do make it into English, but almost always from technical domains (medical, legal, scientific, etc.) and then only when the coinage in the technical domain strikes a larger group of speakers as being especially useful, as supplying a word we have a need for. Epstein and some other peevers think we really need a noun specifically referring to hatred of homosexuals. But people not in the grip of the etymological fallacy know that we already have such a word, namely homophobia. We don’t need another one. Not that there would be anything wrong with having another one; I like homo-hatred for its transparency and its cheeky toughness, and I might toy playfully with homodia, but the world doesn’t actually need these words. It certainly doesn’t need misohomosexual or homomisia. Something the world might need — certainly something I think I could use — is a good snappy word for ‘hatred of homophobia, hatred of homo-hatred’ (who will hate the haters?). Homo-hatred-hatred obviously won’t do, though it’s funny, and even homophobia-hatred strikes me as dubious. Homophodium? It sounds like a perverse musical instrument. Wanna play my Greco-Latin homophodium? This entry was posted on November 15, 2016 at 9:04 pm and is filed under Etymological Fallacy, Gender and sexuality, Innovations, Linguistics in the comics. You can follow any responses to this entry through the RSS 2.0 feed. You can leave a response, or trackback from your own site. Maybe loathe n. would work. I for instance loathe brockley [I know — in Italian it’s *broccoli*.] — especially when it’s cooking. But I’m not afraid of it. So I’m a brockleyloathe. Or is that brockley loathe? loathe is a fine word, deserving of wider use. So I’m a homophobe-loather, or phobe-loather for short. It took me a couple of seconds to appreciate the eye dialect brockley. I have, I think, only the disyllabic variant, and I assume you do too. NOAD lists both, AHD only the trisyllabic variant (which tends to sound hypercorrect, or like a foreignism, to me).